On May 23, STEM in the Park hosted the third annual STEMmy Awards at the Research Triangle Park Headquarters. This event honored students, educators, volunteers, companies, organizations, and schools for their outstanding work in STEM over the past year. Winners were nominated by individuals in the community and selected by a panel of STEM professionals. Nearly 100 people attended the event to celebrate these outstanding individual and group achievements, including winners, their guests, and company sponsors. Jean Davis, President and CEO of the MCNC (Microelectrics Center of North Carolina), served as the keynote speaker for the evening, and spoke to the importance of STEM education, acknowledging that it is essential for all careers. As each individual accepted their Golden Gear trophy, winners were invited to share a few words about their STEM passions and paths, inspiring everyone in the room to continue efforts into the following year. STEM in the Park congratulates all the awe-inspiring winners of this year’s STEMmy Awards, and are thrilled to recognize and celebrate all their hard work. As Logan Hollander, STEM Student of the Year, 5th-8th grade, said: “If we keep teaching STEM to new generations of students, they will become the greatest assets of our future world.” We can’t wait to see what comes next. 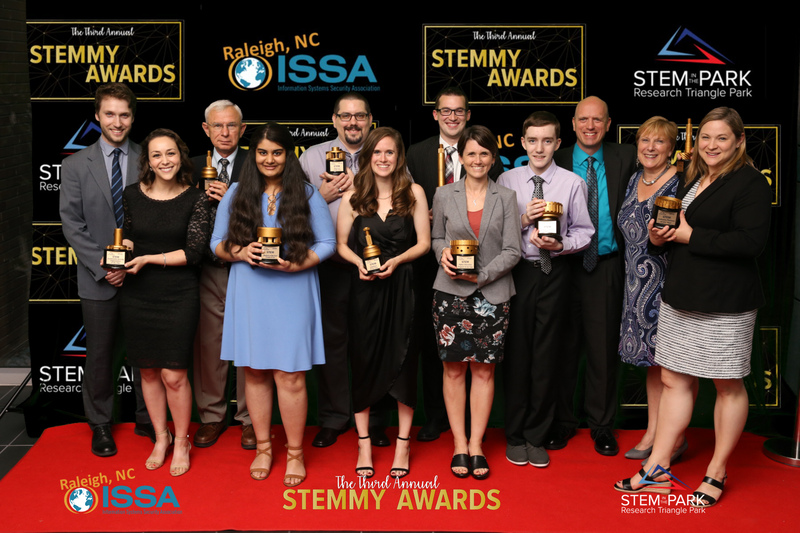 STEM in the Park would like to thank the 2018 STEMmy Award sponsors for making this event possible: ISSA (Premier Sponsor), Biogen, Burroughs Wellcome Fund, Cisco, Fidelity Investments, IBM, RTI, International, Syngenta, Whiting-Turner, and the Research Triangle Foundation. See photos from the 2018 STEMmy Awards. Special thank you to Kevin Seifert Photography for capturing the event.